Pastorelli's Famous Pizza Kits - Pastorelli Food Products, Inc.
Pizza is one of the most popular foods in America today. There’s nothing better than fresh, homemade pizza out of the oven! 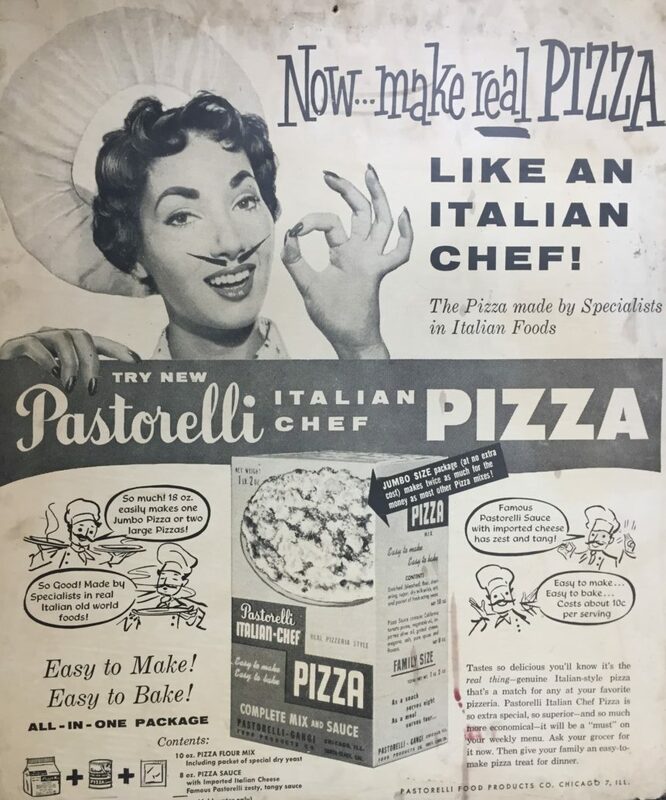 That’s why Pastorelli has been making homemade pizza easy since the early 1950s with the introduction of our pizza kits. After WWII, where many women left the home to go to work. As a result, fewer women had hours in the kitchen to spend making homemade sauce. Seeing a business opportunity, Leandro “Papa” Pastorelli, (with the help of his sister Mary DiStefano and his brother Mario) formulated the Italian Chef Pizza Sauce. Pastorelli created the first fully-prepared Pizza Sauce offered in a can. This was the start to bringing homemade pizza into thousands of homes while also making it fun and affordable. The pizza sauce became a huge hit. Still, Leandro thought sales might improve if he also made pizza crusts easy and fun to make. So he set to work on developing a pizza crust mix and came up with a recipe. The “secret ingredient” to the Pastorelli crust mix was the addition of lard flour. This gave the crust a solid chewiness. The next step was putting everything together in a package for consumers. It was important to Leandro that the pizza kit be affordable to consumers so everyone could have homemade pizza regularly. He tallied the costs of the ingredients per dozen: $0.675 for the tomatoes, $0.12 for freight, $0.48 for spices and oil, $1.03 for the yeast and flour, $0.29 for packaging, $0.10 for labor and $0.50 for distribution, for a total of $3.19 or about $0.27 per kit. With Pastorelli’s markup and the grocery stores’ markups, it could sell for about $0.40- or about $0.10/serving. After that he calculated the capital he would need to get things up and running. Between the ingredients, machinery, packaging and artwork he needed a total of $39,700. Adjusted for inflation, that would be about $363,830 in today’s dollars. After successfully gathering up the capital and testing the product, the pizza kits launched in 1954. For the next 20 years, before frozen pizza gained popularity, the Pastorelli Pizza Kits were extremely popular. The kits were discontinued in 1995, though the pizza sauce remained a top seller. As homemade pizza is regaining popularity in households across America, Pastorelli continues to stay on top of the demand with our par-baked pizza crusts which were introduced in 2014. They are all-natural, with no preservatives or artificial ingredients. Pastorelli sells the large pizza crusts in packs of three which offers better value than other crust brands. Ultra-thin and crunchy, they bake in about 6-10 minutes. This makes homemade pizza a quick and easy meal that anyone can prepare!